FijiFirst Leader Voreqe Bainimarama has urged the people of Labasa not to listen to sweet talk by politicians from other parties. 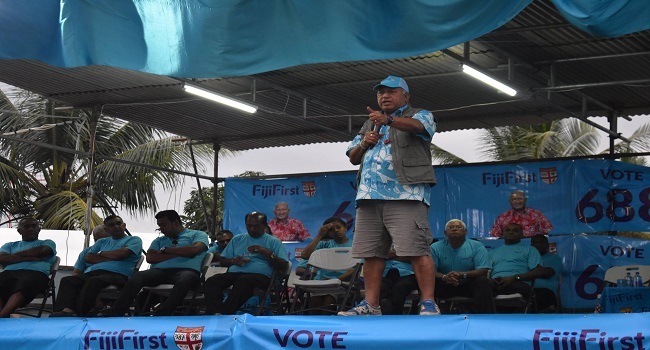 Speaking at the FijiFirst Party Family Fun Day in Labasa yesterday, Bainimarama says these politicians are only sweet talking their way to get votes as their policies are outrageous. He told the hundreds of supporters that turned up at Subrail Park – to block their ears from what’s being preached by these politicians but to open their eyes to see what the current government has done for them. Bainimarama concurred with politicians who say that development is the work of any government but adds, no other government has achieved what the FijiFirst government has. He says government’s development record speaks for itself – being done at a pace no other government has done and is as far reaching as possible. He says development is being done on the basis of inclusivity, leaving no one behind.